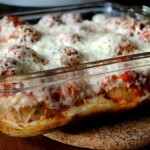 Today’s recipe is a lightened up version of Publix’s meatball casserole. It’s simple to make and was a big hit in our house. Preheat oven to 400 degrees. Spray 9-inch baking dish with cooking spray. Cut baguette into one-inch-thick slices and arrange in baking dish, packing tightly to fit. Combine goat cheese, Greek yogurt and spices and spread mixture over bread slices. Sprinkle with 1 cup mozzarella cheese. Bake 6 – 7 minutes until cheese bubbles. Cook meatballs according to package microwave directions. Stir marinara sauce into meatballs and pour on top of cheesy bread. Top with remaining cup of mozzarella cheese and bake 5 – 7 minutes until cheese melts and sauce is hot. Recipe slightly adapted from Publix Aprons Meatball Casserole.